Eliminate Spam -- How would your organization benefit from zero spam? At Artisan, we dont remember what spam was like. Affordability  A hosted version of Exchange 2007 allows you to lower Total Cost of Ownership by using Artisans hardware, infrastructure, and personnel. Productivity  Exchange allows your team to collaborate more efficiently on projects through the ability to share calendars, tasks and important contacts. Sharing notes and files on the included shared folders can act like a virtual message board, promoting more efficient teamwork. Anytime, Anywhere Access to mission critical data  The office isnt the only place where you and your team can be connected to your business. Exchange 2007 allows everyone on your team to access their important data and communications from any Internet connection or on their mobile device (i.e.  Smartphone, BlackBerry, iPhone). Security  Using mobile devices increases the possibility of theft or loss. Artisans Exchange hosting ensures your informations security on your desktop, but also includes safety measures such as remote device wipe for lost or stolen mobile devices. Also, with all emails and information to our Exchange being encrypted, you can be sure your companys communications are kept from prying eyes. Make the most of your IT (or lack thereof)  you dont need a dedicated IT department just to get your company on the fast track to enterprise-level communicating. Artisans team of IT professionals works around the clock managing your Exchange service, so you dont have to. Quick and Easy Implementation  Getting your email up and running using Artisans Exchange hosting is a breeze. Our technical support team can have your email up and running within minutes of signing up. 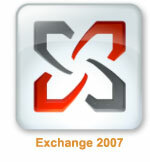 Improved spam and virus filtering system for Exchange 2007 comes standard with every mailbox.